Welcome to a new week….the last one before we turn the calendar page to September and begin the mad dash of “back to school” or “back to work”! Today, I want to pass along some good tidbits. 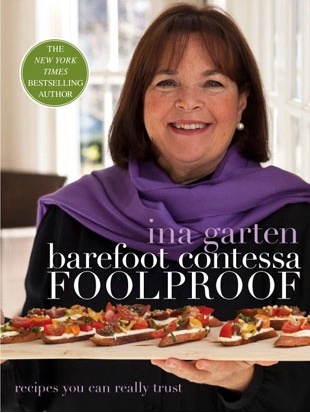 First off, I am thrilled that Ina Garten is coming out with her new book, Barefoot Contessa Foolproof – recipes you can really trust on October 30th. I’ve been a fan of Ina’s from the beginning and think this could be a fitting title for all of her cookbooks, as everything I’ve ever made from one of her recipes has turned out beautifully. Good food, that you actually enjoy preparing and feel confident serving. In this latest cookbook, Ina takes us past the recipes and shares her secrets for getting everything on the table while it’s hot, so you can keep your hostess cool! You can pre-order at a discount from Amazon…OR for the face value of the book ($35), you can call the Barefoot Contessa office at 631-324-0240 and order autographed copies. Think…holiday gifts! Second, if you’re already eyeing those yummy looking tomato crostinis with whipped feta on the cover of her new book, the recipe is here! 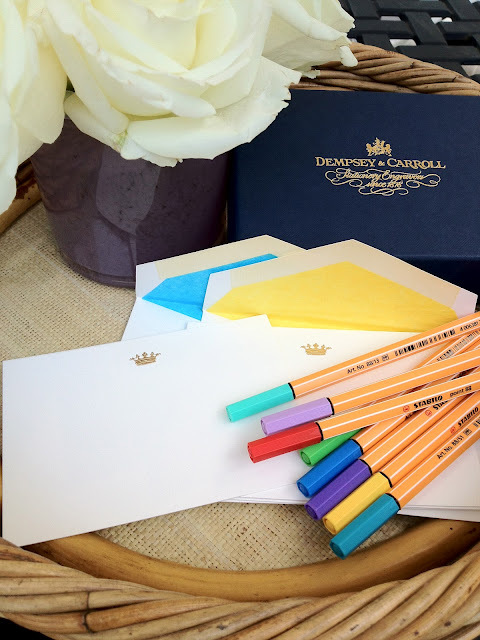 Finally, after seeing the post I wrote on Friday about my new favorite stationery, the sweet folks at Dempsey & Carroll are offering all of you FREE SHIPPING through the end of August with the code pinktulip12! Again, I know it’s only August, but think holiday gifts. And, you may actually get to enjoy the month of December! I must admit to loving every recipe I have ever tried from Ina along with really classy stationery! Thanks for sharing so many wonderful classy things here and giving me some great ideas for holiday gifts too. Hi Elizabeth…….I too am a big Ina fan, love and consider many of her recipes to be in house favorites over here. I cannot wait for the new book either…..and scary as it sounds, you are right, not too soon to start thinking holiday! Elizabeth, I'm so excited for the Barefoot Contessa's new book – I have to say I owe many a successful meal and dinner party to her. It's true, every recipe has been fool-proof for me, too! She is actually coming to Seattle in a couple weeks and some friends and I are going to a reception where we will get to meet her. I am THRILLED! I love the BC cookbooks and have already added this one to my wish list. I've made so many of her recipes with great success. Simple, delicious and pretty much foolproof. I love pretty stationery, and the free shipping may just tip me over the top to adding some more. Not that the 4 drawers full I have are running out anytime soon! Elizabeth I am very excited to add this book to my collection; adore Ina! I agree – her recipes always turn out great! I'm excited to get her new cookbook – I think I'm going to spring for the autographed version! I so enjoy reading your blog and you always have such wonderful ideas. Do you have any suggestions for a gift – my son has spent the weekend twice this summer at a best friends summer home and I would like to acknowledge and send something special – any thoughts? Such great tips! Love the cook book idea, need it! I love Ina and can't wait for her new book!! I like that this one is "fool proof" as I'm not the best cook 🙂 I think I'll buy a few to give as presents. YEAH for another Barefoot Contessa!! My favorite!! I've got to take advantage of the free shipping on the pens! Oh! forgot to mention the cookbook! I have ALL of her cookbooks and wasn't aware that a new one was coming out. Sounds great and I'll look forward to taking a look at it. Have a nice evening Elizabeth. Wishing you a great new week too! !